My girls love to do puzzles. In fact, during our daily read aloud time, each of them grab a puzzle and a place on the floor. 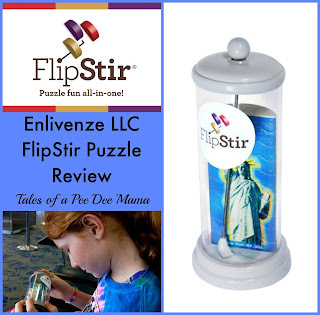 Needless to say, we were excited to try the FlipStir Puzzle Statue of Liberty from Enlivenze LLC. For this review, we received the Statue of Liberty FlipStir puzzle - a 3-dimensional, self-contained, 10-piece puzzle. If you're like me, when you hear that a puzzle has ten pieces, you think, "Oh, this will be a piece of cake." Let me tell you, that is not the case with these puzzles. They are definitely challenging. As you can see in the picture above, the puzzle pieces are enclosed in a container that also houses the wand you use to help guide the pieces into place. To begin, you simply shake the container to undo the completed puzzle. Then, using the wand and a whole lot of brain power, you manipulate the pieces into place. When the Statue of Liberty puzzle arrived at our house, I couldn't wait to try it out. Apparently, I am not gifted at spatial awareness, hand-eye coordination, or small motor skills because after 5 minutes, I hadn't even put the first 2 pieces together. At that point, my girls were wanting a turn with it, so I happily handed it off to them. A couple of them got a little further than I did that first day, but no one was able to complete the entire puzzle that day. Thankfully we are a stubborn group at my house; many attempts were made over the next few days to get the Statue of Liberty to actually LOOK like the Statue of Liberty. At last, Little Red was able to finish the puzzle! She was so excited! Once she was able to figure out the secret to successfully completing the puzzle, she was able to do the puzzle more quickly each time she tried it. On our trip to Sacramento for the National Track and Field Meet, Little Red and I had a good bit of down time in the airport. Well, not between flights there when we had to run to make our connection, but the rest of the trip there and back home gave us some time to kill while waiting to board the planes. She had packed the FlipStir puzzle, and that kept her occupied for a good bit of time while we were sitting around. 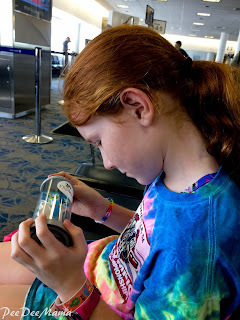 I loved that, since the pieces are enclosed in the container, there was only 1 item that we had to keep up with and I didn't have to worry about her losing pieces in her backpack, in the airport, on the plane, at the hotel, etc. I also liked that it gave her something to do that engaged her brain and didn't involve an electronic device! FlipStir Puzzles come in 2 levels of difficulty. The Statue of Liberty puzzle is a level 2, so they do offer puzzles that aren't quite as difficult as this if your child (or you) need to start with something a little easier. The puzzles at Level 1 are Rainbow Pencils and Tyrannosaurus Rex. Other Level 2 puzzles include The Solar System and The Periodic Table. Are you interested in what others have to say about Enlivenze LLC and FlipStir Puzzles. Check out more reviews from the Schoolhouse Review Crew.